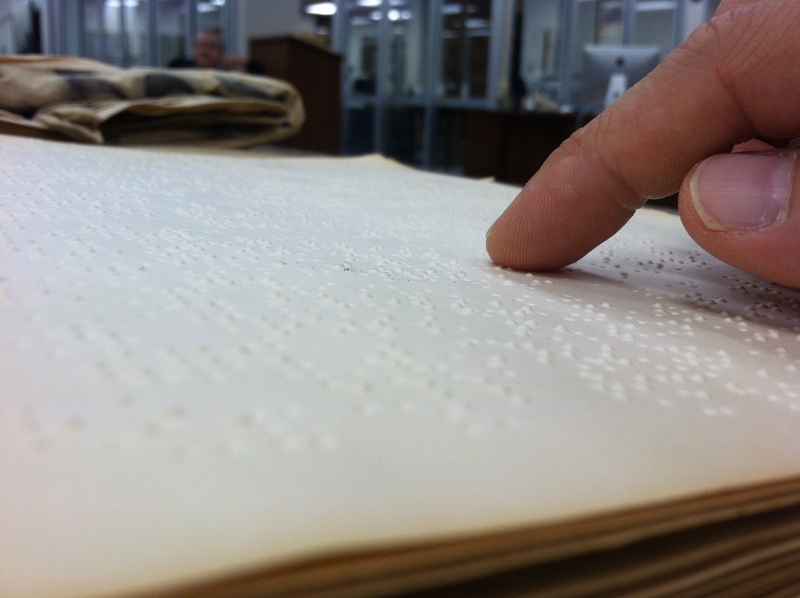 We had a special treat a few days ago when several participants in the TX Singing School visited Special Collections for a tour. 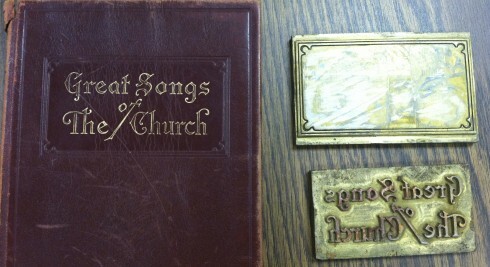 In response to their request, I pulled several hymnals and related artifacts for a brief show and tell. We thought you’d like to see the pictures. Elias Smith, A Collection of Hymns, for the Use of Christians. Boston: Manning and Loring . 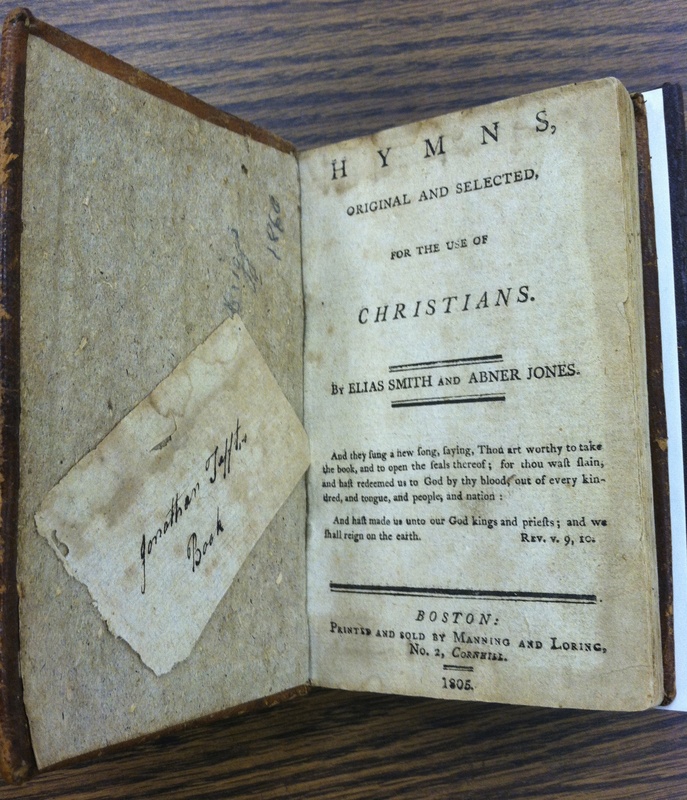 Elias Smith and Abner Jones, Hymns, Original and Selected, for the Use of Christians. Boston: Manning and Loring, 1805. 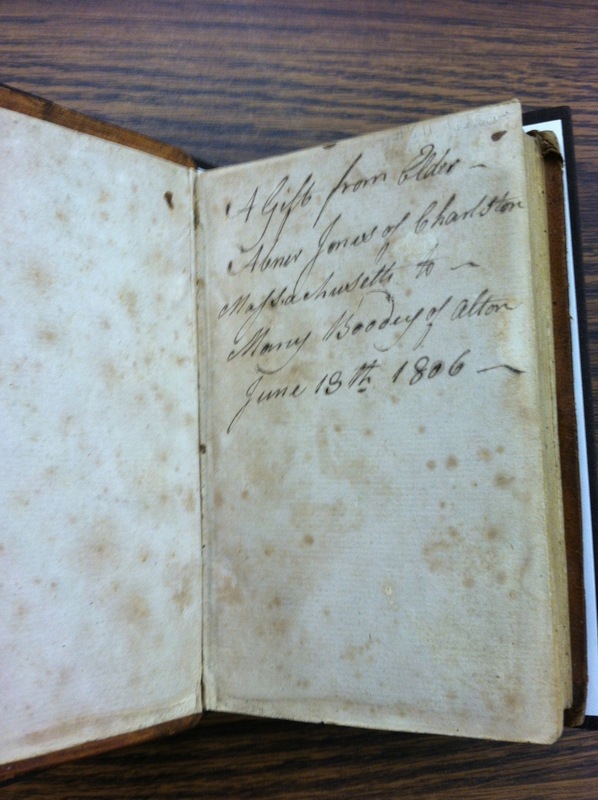 Here is an inscription in another edition of the Smith-Jones hymnal: “A Gift from Elder Abner Jones of Charlston Massachusetts to — Mary Boodey of Alton June 13th [or 18th] 1806–.” This inscription may be from Jones’ hand, or from Mary Boodey’s hand. 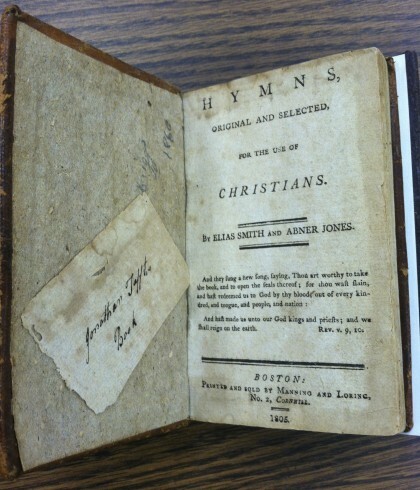 I suspect Mary to be the wife or daughter of Joseph Boodey [or Boody] a minister whose book detailing his call to the ministry was advertised in an 24 November 1808 issue of Elias Smith’s Herald of Gospel Liberty. A nice inscribed association copy with an inscription! 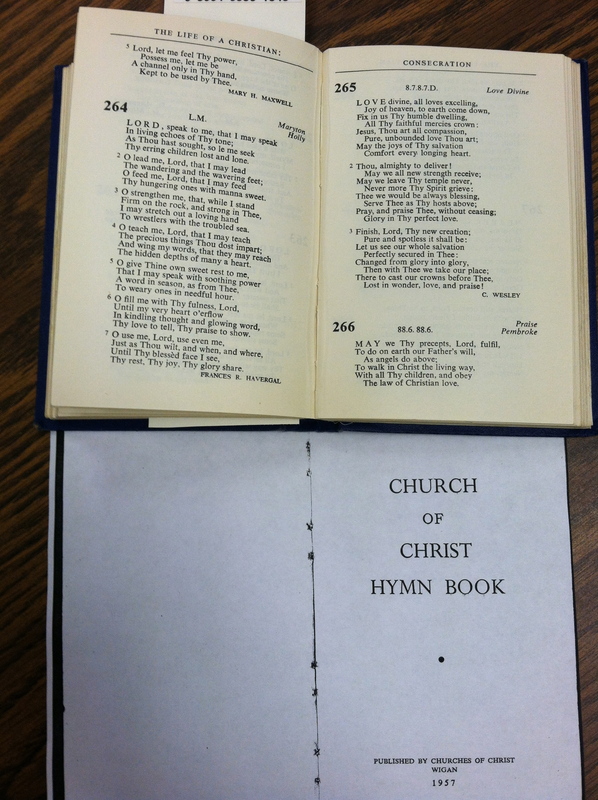 This table displays the assortment of Smith-Jones hymnals on the bottom row. 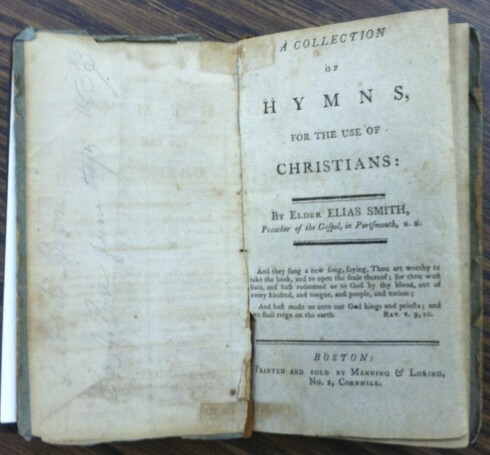 With the acquisition of the Joe Johnson Collection in American Christianity, ACU received a fine collection of Smith-Jones hymnals, and each one is in remarkably nice condition. 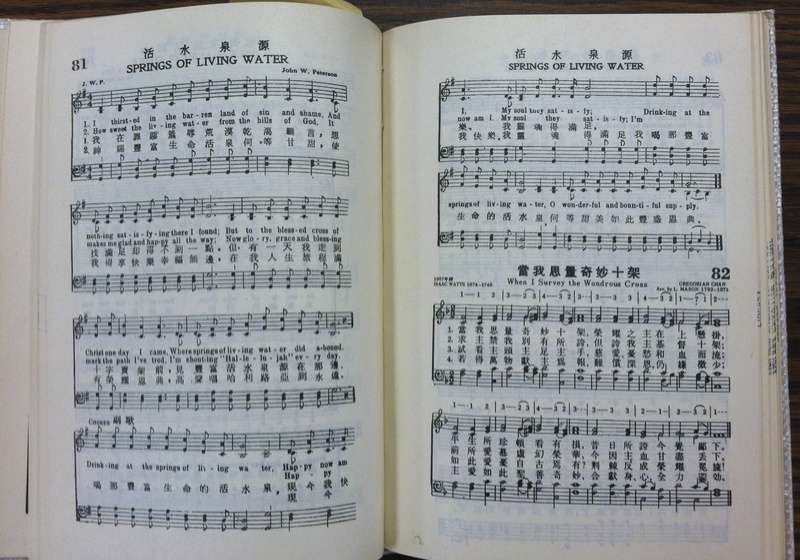 On the other side of the table is a row of Campbell hymnals with a photocopy (oblong red buckram volume at the top of the photo) by Enos Dowling that we use for reference rather than handling the early originals. 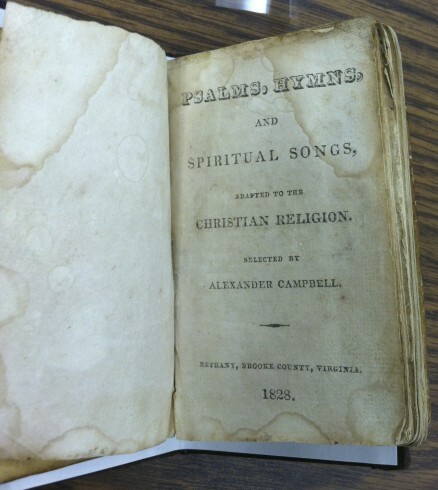 Alexander Campbell, Psalms, Hymns, and Spiritual Songs, Adapted to the Christian Religion. Bethany, 1828. Four Campbell hymnals, ca. 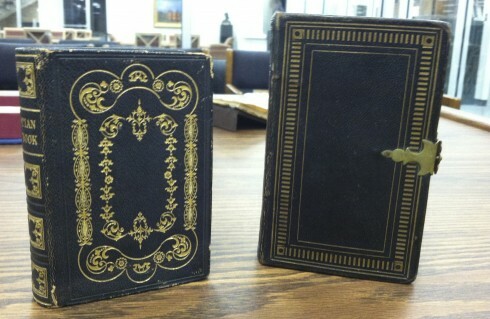 1840’s-1850’s. 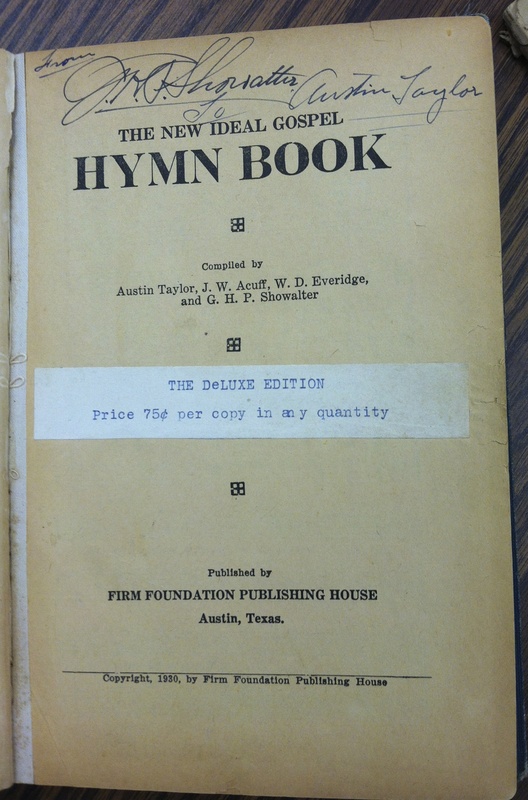 When hymnals were privately purchased the tastes and finances (and theology!) of the purchaser dictated the type and style of binding. Here are two plainer styles of leather binding and two fine gilt-embossed calf-bound ones. 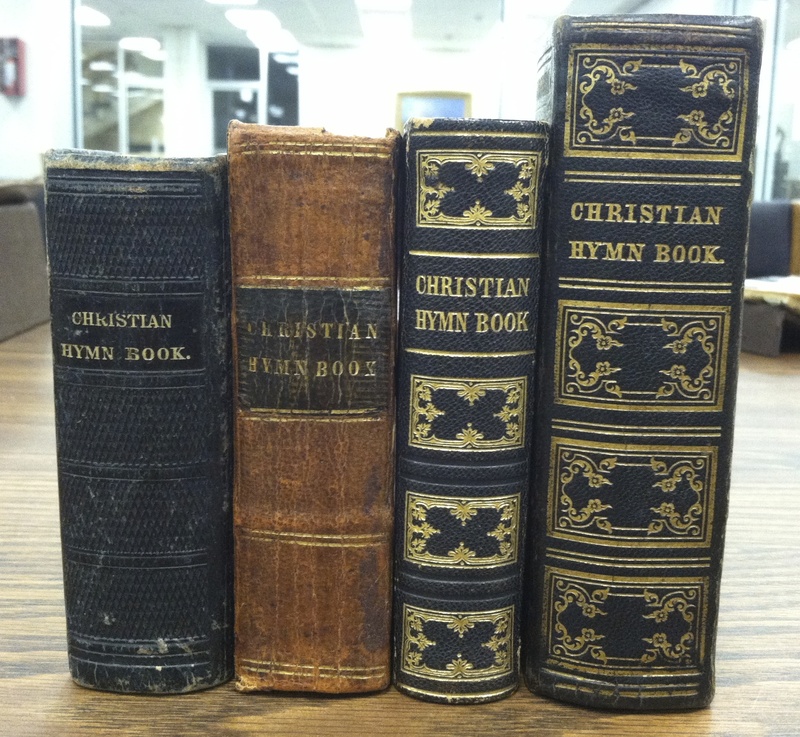 Later in the nineteenth century congregations purchased hymnals in bulk to be kept and used at the meetinghouses, gradually closing an era when worshipers brought their own hymnals. We thought a letter from Alexander Campbell’s hand would be a fine addition to the exhibit. 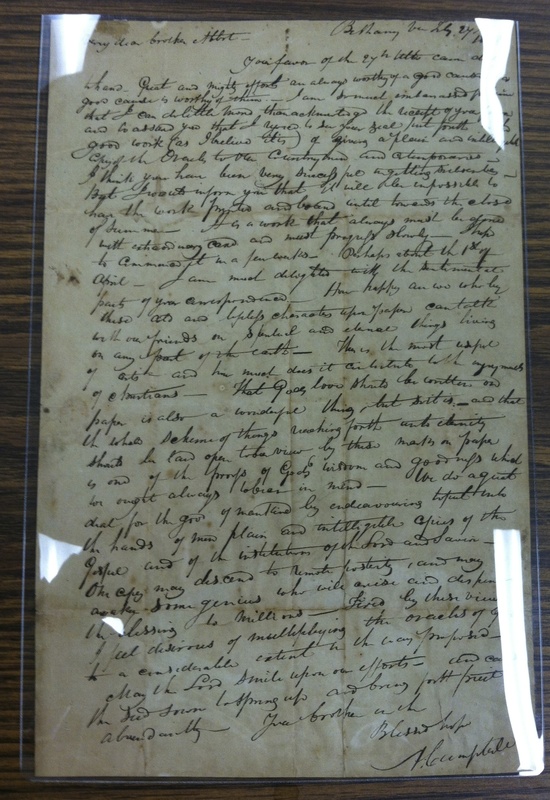 The paper, which served double duty as its own envelope, is housed safely in a Mylar sleeve. We apologize for the glare. 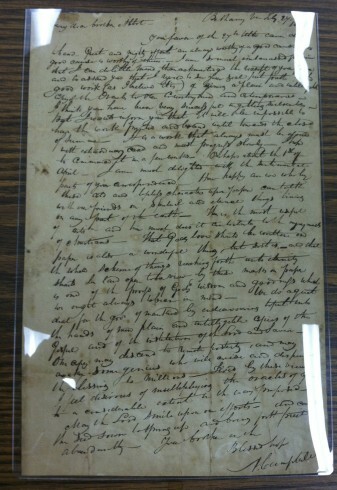 Below is a transcription. 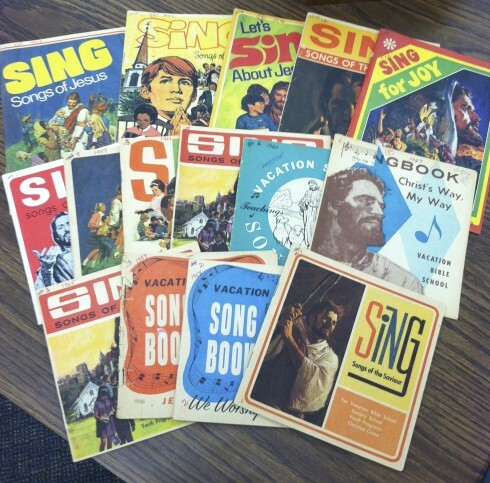 Since Austin Taylor established the singing school, we thought an item or two from his collection would be a big hit. We were right. 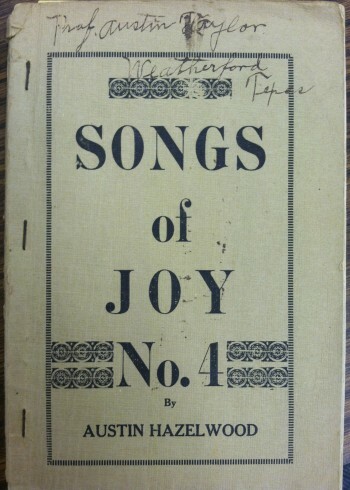 Above is his copy of Songs of Joy No. 4. Below is another inscribed association copy. 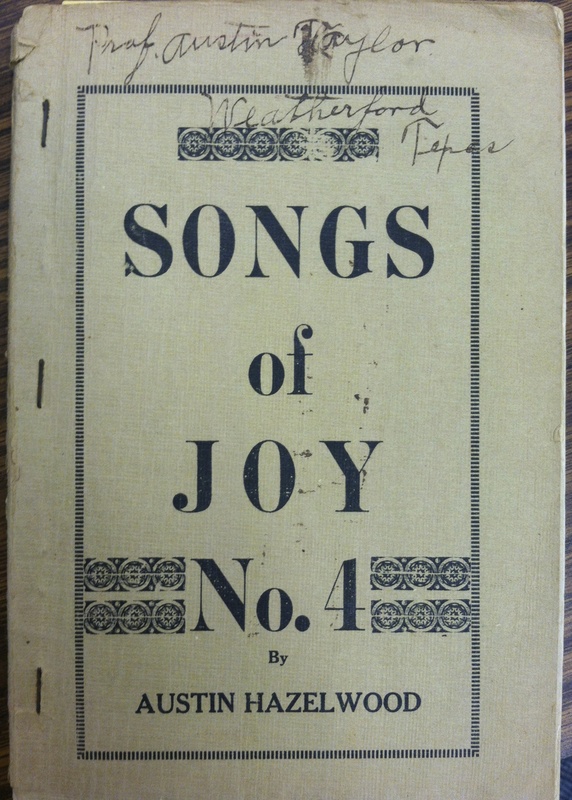 George Henry Pryor Showalter was editor of Firm Foundation and co-compiler with Taylor (and others) on The New Ideal Gospel Hymn Book . 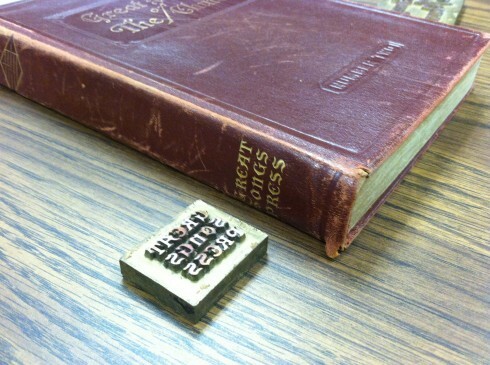 Here is Taylor’s copy, bearing a gift inscription from the publisher. 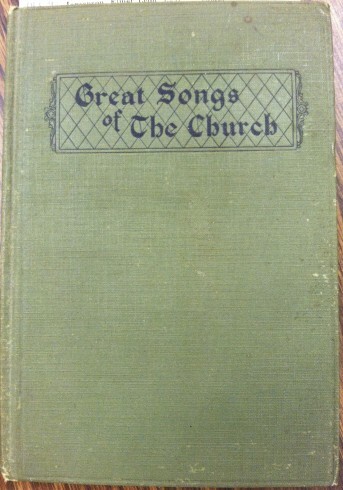 Among the most enduring hymnals among Churches of Christ are the Great Songs of the Church family of hymnals. 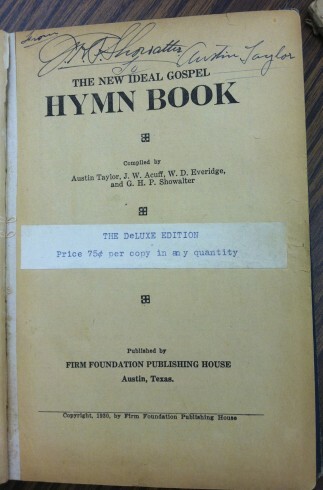 The 1922 copy below was part of Austin Taylor’s collection. 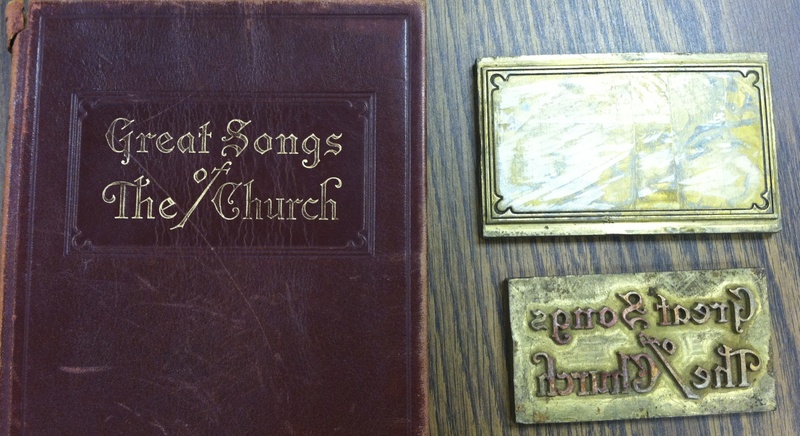 Here is a red leather bound ‘deluxe’ edition of Great Songs with brass embossing plates used in the production of “Number Two.” The plates were gifted to ACU by Tillit S. Teddlie. 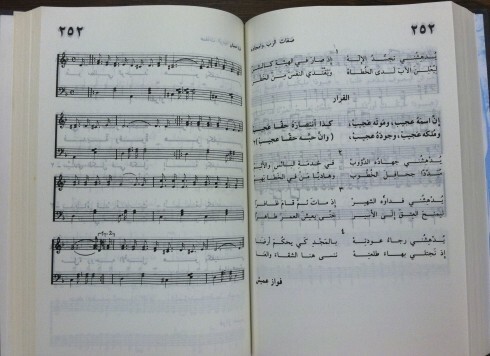 The earliest hymnals above did not have musical notation. Assuming the meter matched, the texts could be coupled with various tunes. 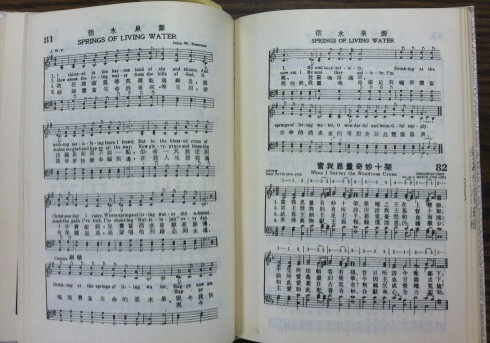 Convicted that notes on the page was a distraction from the content of the song, Alexander Campbell did not allow his hymnal to carry notation. Here is a 1957 hymnal used among British Churches of Christ. Look for the meterical indicators, pair the text with a matching tune, and set yourself to singing! Dr. Leonard Burford was long-time choral director and Professor of Music at Abilene Christian College. 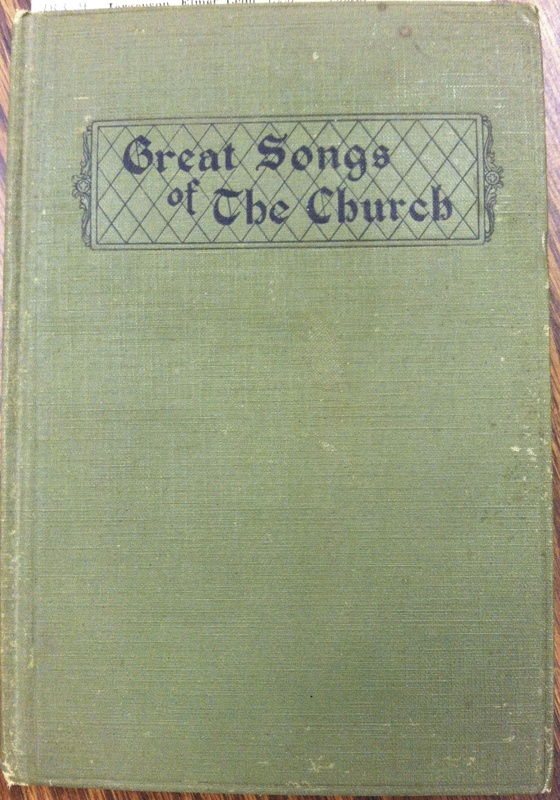 Blind, Burford compiled this braille hymnal and with his brother Jack (also blind) produced several albums of the ACC Chorus. Hymns of the Church was printed in Louisvile, Kentucky by American Printing House for the Blind in 1958. 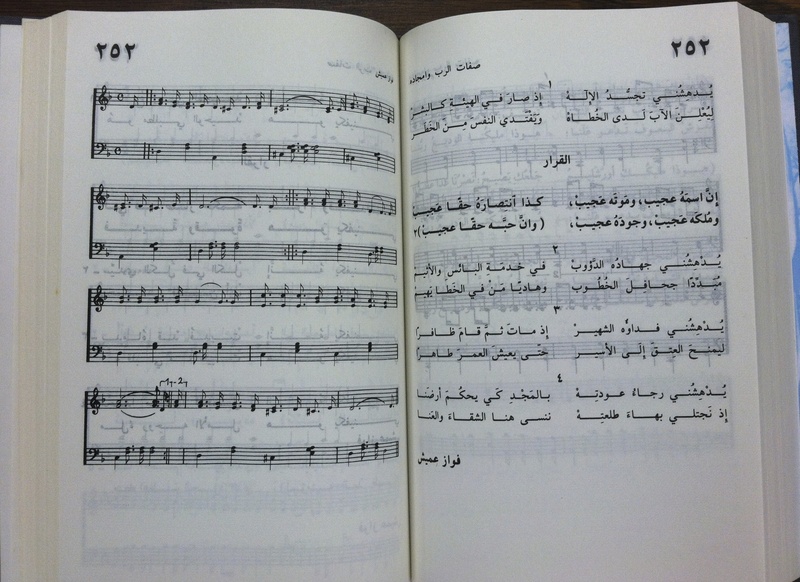 This Arabic hymnal, Hymns of Faith, was published by Dar Manhel in Alhayt, Lebanon. Since summer is the season for Vacation Bible School, we thought it appropriate to include an assortment of VBS songbooks from the early 1960’s to the later 1970’s. These are from Standard publishing Company of Cincinnati, Ohio. I think these may actually be rare (certainly not as rare as the Smith-Jones items!) since they were produced, used and discarded. When next year’s VBS kit rolls out, the old ones get tossed aside. Should you have such in your closets at church, please consider donating them to our collection. We want to save them! In an age of Power Point, we took our guests back to an earlier time when visual aids consisted of bedsheets-turned-sermon-charts hung in brush arbors. Here is a nicely illustrated one. You can see dozens more here. 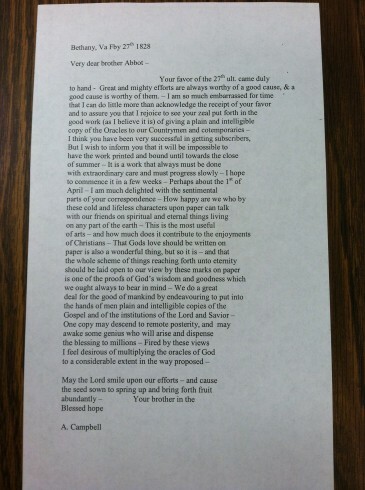 This entry was posted in Exhibits by Mac Ice. Bookmark the permalink.